NAVCO Vibrating Tables are custom engineered to fit your specific application requirements. Our tables are available with several different drive options, depending on the power source available and the application requirements. Each table is designed with a vibration isolation system that allows the energy input to the material to be maximized while minimizing the vibration transmitted to the frame and supporting foundation. NAVCO is extremely experienced at seamlessly integrating custom vibratory tables into existing processes and providing the controls needed to maintain precise control of your vibrating table. 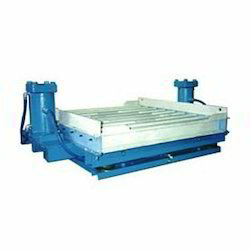 Vibrating tables have been successfully utilized in a diverse set of applications through a wide range of industries. Vibrating Tables are custom engineered to fit your specific application requirements. Our tables are available with several different drive options, depending on the power source available and the application requirements. Each table is designed with a vibration isolation system that allows the energy input to the material to be maximized while minimizing the vibration transmitted to the frame and supporting foundation. NAVCO is extremely experienced at seamlessly integrating custom vibratory tables into existing processes and providing the controls needed to maintain precise control of your vibrating table.Vibrating tables have been successfully utilized in a diverse set of applications through a wide range of industries.